ACTICOAT Moisture Control Absorbent Antimicrobial Dressing is an absorbent 3-layer dressing consisting of the following: A nanocrystalline silver-coated polyurethane layer, a white polyurethane foam layer and a blue waterproof polyurethane film layer. ACTICOAT Moisture Control provides an effective barrier to bacterial penetration. In the presence of exudate the dressing will help maintain a moist wound environment. ACTICOAT Moisture Control may be left in place over a wound for up to 7 days. ACTICOAT Moisture Control eliminates threats to healing. It features a powerful antimicrobial barrier protection and a waterproof film with visible strikethrough indicates when dressing change is required. The highly absorbent hydrocellular technology wicks away excess exudate. Patented nanocrystalline technology sets ACTICOAT apart with proven bactericidal activity. 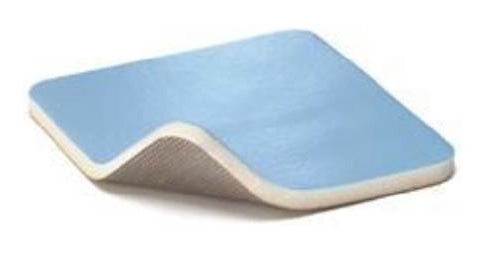 It has a non-adhesive wound contact layer allows minimal pain on removal and extra cushioning maximizes comfort. It is easy to apply and remove. No hydration or cover dressing is required. It maintains shape for faster, cleaner dressing changes and provides 7-day wear time. -Provides fast-acting, long-lasting antimicrobial barrier control. -Laboratory studies show that the ACTICOAT dressing kills micro-organisms faster than conventional products such as silver sulfadiazine (1 percent cream) or silver nitrate (0.5%) solution. It has also been shown in-vitro to provide protection against more than 150 pathogens. The pathogens tested in the lab include very resistant strains of bacteria such as antibiotic-resistant strains of Pseudomonas, methicillin-resistant Staphylococcus aureus, vancomycin-resistant Enterococcus and fungi. These pathogens have been known to sweep through a hospital and infect a great many patients with already weakened immune systems. Infections contracted during hospitalization caused by these so-called superbugs and other organisms cost North American taxpayers an estimated $18 billion a year in additional hospital care. -ACTICOAT is versatile. The dressings can be cut to the desired shape and size to wrap around all body parts. -The sustained release of silver also means fewer dressing changes, resulting in less exposure of the wound bed to the environment. ACTICOAT Moisture Control Dressing is indicated for use in light to moderately exuding partial and full thickness wounds including decubitus ulcers, diabetic ulcers, 1st and 2nd degree burns, and donor sites. ACTICOAT Moisture Control may be used over debrided and partial thickness wounds. -Where required, wound cleansing should be performed according to local clinical protocol using sterile water only. -Choose a dressing that is larger than the wound. -Remove the ACTICOAT Moisture Control dressing from the pack using an aseptic technique. -Cut to shape as necessary for awkward areas. -The dressing should not be moistened prior to use as it is indicated for use on exuding wounds. -Place the silver layer in intimate contact with the wound bed, ensuring the entire surface is covered. -Secure with an appropriate secondary retention dressing. -ACTICOAT Moisture Control may be used under compression bandages. Cut the dressing to the size of the wound, check regularly and change it. -The dressing may be left in place up to 7 days, but will require earlier changing if a strikethrough of exudate occurs. -The dressing may adhere if used on lightly exuding wounds. If the dressing is not easily removed, moisten or soak to assist removal and avoid disruption of the wound. Note: ACTICOAT Moisture Control may cause transient discoloration of the surrounding skin. -Do not use on patients during MRI (Magnetic Resonance Imaging) examination. -ACTICOAT Moisture Control is not compatible with oil-based products such as petrolatum. -ACTICOAT Moisture Control may not be compatible with topical antimicrobials. -Do not use ACTICOAT Moisture Control with saline. -ACTICOAT Moisture Control is not compatible with oxidizing agents (eg. EUSOL) as these can break down the absorbent polyurethane component of the dressing. -Avoid contact with electrodes or conductive gels during electronic measurements eg. EEG and ECG. -If reddening or sensitization occurs, discontinue use. -ACTICOAT Moisture Control Dressings are not intended to provide treatment for infected wounds. ACTICOAT Moisture Control Dressings may be used on infected wounds which are being managed in accordance with institutional clinical protocols for infection abatement as an adjunct to the standard treatment regimen to provide a barrier to bacterial penetration.